How should you respond when Russian submarines allegedly breach sovereign waters? Isn't it obvious? A gay singing sailor sign of course! How should you respond when Russian submarines are allegedly cruising through your country’s sovereign waters? A group of peace-loving Swedes came up with a simple and undeniably creative way to diffuse tensions. Ok, it’s maybe not advisable to poke the bear but there’s surely no harm in tweaking it’s nose. How? Behold the gay underwater singing sailor sign. Of course it’s appropriately finished off in neon pink. How fabulous! The architects of this underwater activism are The Swedish Peace and Arbitration Society (SPAS). The peace organization has approached the more sobering issue of trespassing Russian submarines with a device emitting an anti-homophobic message to passing submariners in Morse code. SPAS have dubbed the installation a subsurface sonar system. Operation Singing Sailor, features a dancing sailor wearing nothing but a hat and briefs. 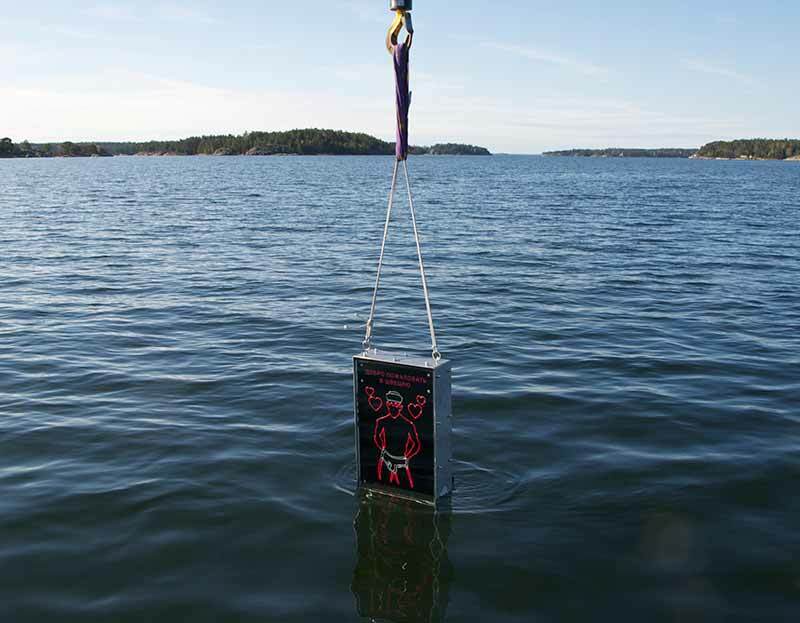 The sign is located just off the coast of Stockholm, where a Russian submarine was previously sighted. The singing sailor sign says “Welcome to Sweden. Gay since 1944.” in both Russian and English, and is a part of SPAS’ “Singing Sailor Underwater Defence System”. Just to make things abundantly clear the singing sailor sign also emits a Morse code message saying, “This way if you are gay”. Anna Ek, SPAS’ president, explains that in spite of the sign’s humorous tone, the message is, without question, serious. Her group wants to express the disagreement towards terrible conditions under which LGBT people have to live in Russia, and at the same time urge the Swedish government to deal with Russia’s alleged violation of its borders in a peaceful way. Sweden has actually cut its military budget in recent years, but has reversed that policy, as a direct result of this alleged violation of Sweden’s maritime sovereignty. In October 2014, Sweden launched a military operation to find a submarine after a retired lieutenant colonel reported seeing it in the Stockholm archipelago. Swedes spent a princely sum of 23 million Swedish kronor (about £2.2 million), but came up empty handed, which resulted in international “mockery” for the nation. SPAS hopes that this new campaign will change things and make the government see that pointing guns at each other is not a sustainable way to live. However, as tensions between Sweden and Russia increase the Swedish government have announced an increase in defense spending of $740 million between 2017 and 2020. The Swedes have also re-introduced conscription and deployed troops to the strategically important Baltic island of Gotland. Get the best bits in our weekly newsletter. Luxury Car Vending Machine? Yes, That’s a Thing!